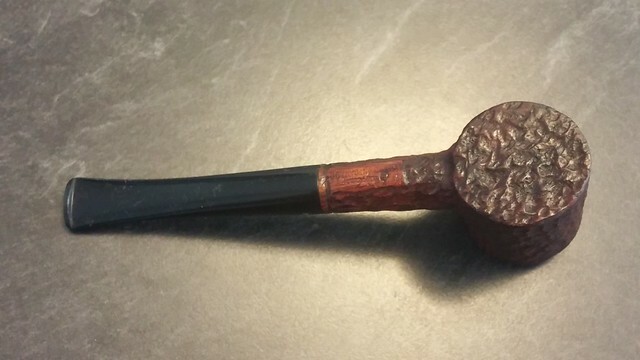 Before I came across this pipe, the only Poker in my Brigham collection was one that I had inherited from my father. 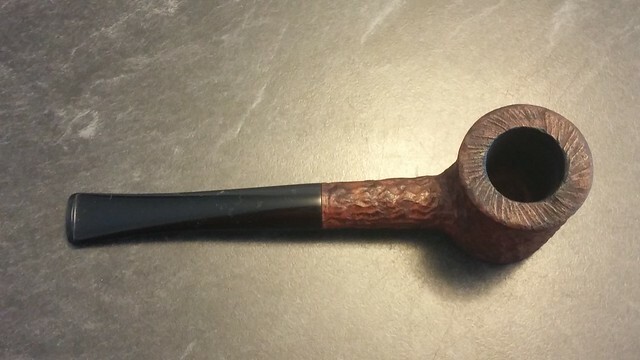 I prefer to view those pipes as keepsakes rather than smokers, so I was happy to come across this Standard grade 1-Dot poker in a lot of pipes I purchased from a local piper. 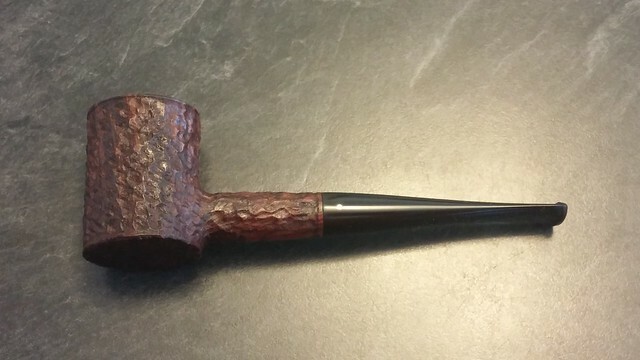 The pipe was in fairly good estate condition when I started working on it, with the major issues being a heavily oxidized stem and a bit of lava stuck in the wire-cut rim rustication. 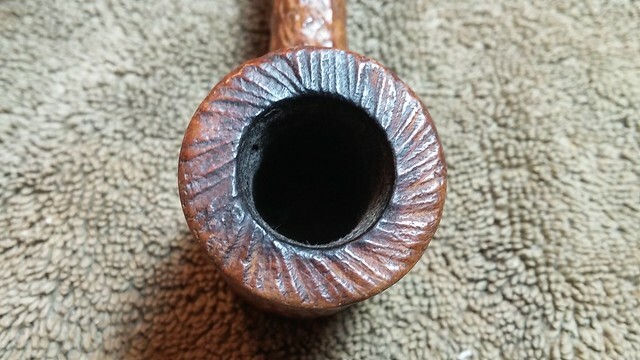 The briar’s finish was worn, especially on the sides of the bowl, the chamber had a decent layer of carbon cake in it, and the stem would need some work to remove tooth chatter and one larger dent, but overall there was nothing alarmingly wrong with the pipe. 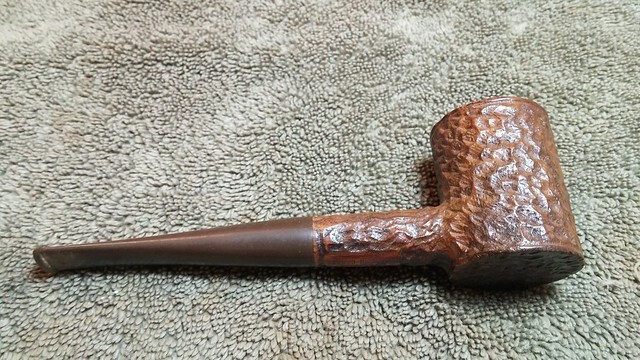 Of particular interest to me was the Twin- Bore stem on this Brigham Poker. 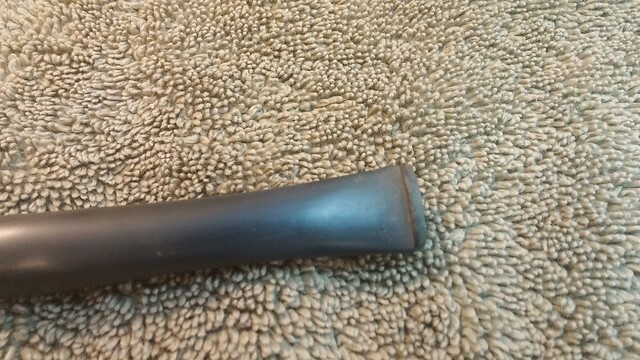 The Twin-Bore was a factory option when this pipe was produced. 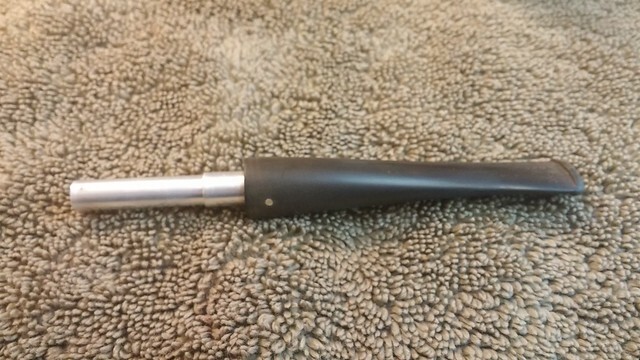 Many North American manufacturers offered such a stem, designed as a crush-proof alternative to a slotted bit – popular with heavy clenchers, but not that common on a Brigham, in my experience. 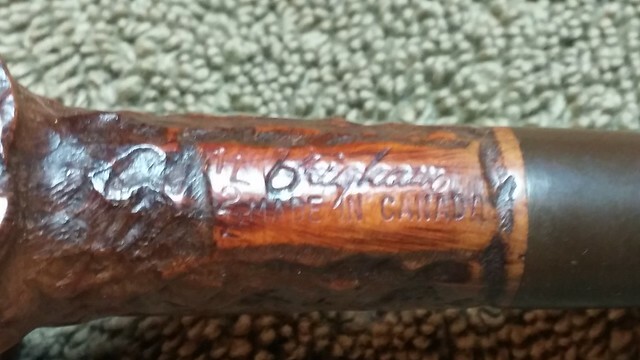 Stamps on the underside of the rusticated stummel read “122”, stamped vertically, followed by “L”, then “Brigham” in a horizontal script over “Made in Canada” in block letters. These combine in my mind to date the pipe to the mid/late 1960’s. 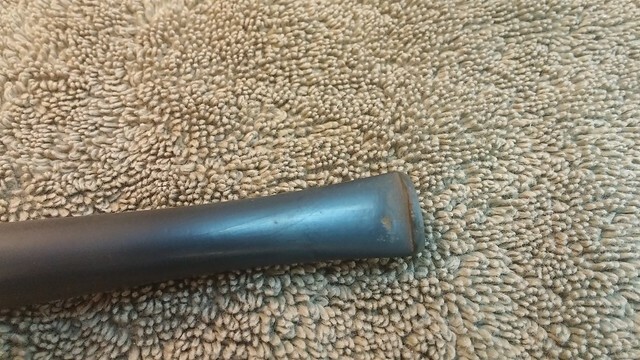 The “L” stamp indicates a Large sized bowl; the size stamps were in use in the early to mid-20th Century, but fell out of use somewhere in the 1970’s, I believe. 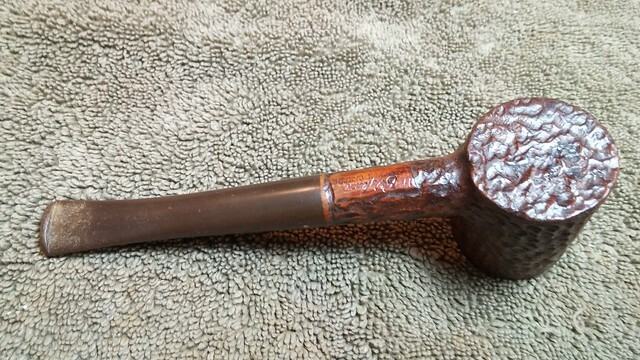 As an aside, Brigham originally offered most if not all of their pipes in every size (S, M, ML, L, XL), generally during the early decades in which pipes were named instead of given shape numbers. The size stamps were used to differentiate the variants of a standard shape. 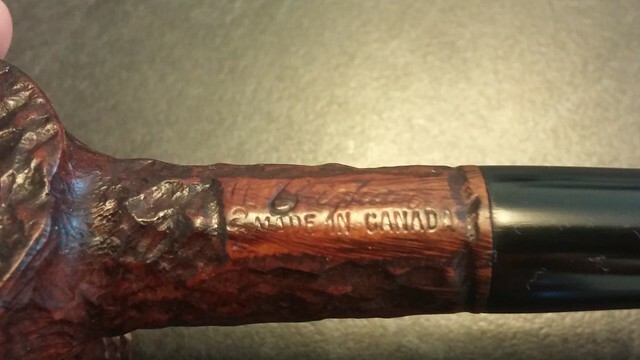 Some shapes, notably the Billiard and Dublin pipes, were treated as different models if produced in different sizes. My earliest Brigham catalog clearly shows Billiards in three sizes, listed as three separate models. When shape numbers were implemented, their Medium Billiard became a Shape 02, the Medium Large Billiard became a 03, and the Large Billiard a 04. (The Chimney or stacked billiard, was assigned Shape number 044T, but that’s getting a bit far afield for today….). 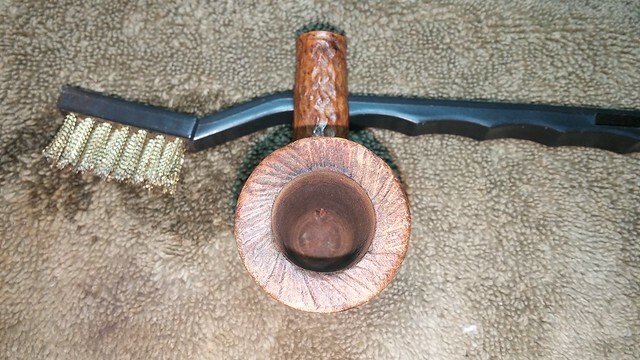 Getting back to the pipe at hand, I started the cleanup by reaming the old cake from the tobacco chamber and then using a brass tire brass to lift the lava out of the rim rustication. Underneath the lava, the rim was in good condition. 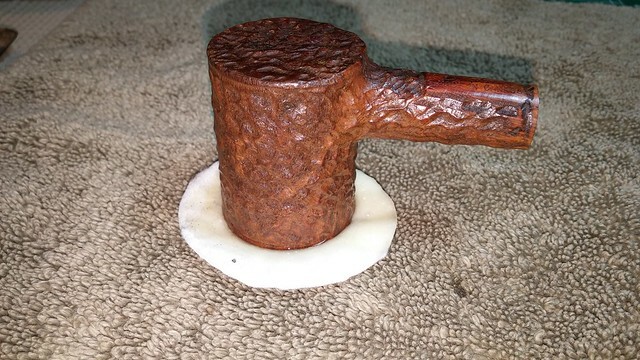 I tried something a bit different next, standing the stummel upright on top of an alcohol-soaked cotton pad. 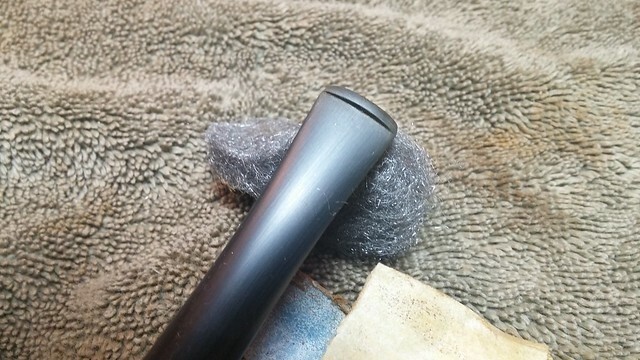 I wanted to soften and lift away the remaining rim darkening without subjecting the delicate rustication to more brass brushing than necessary. The technique worked, though it made a bit of a mess on the desk! 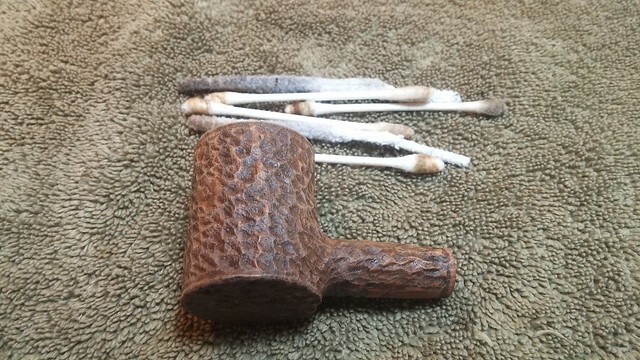 The oxidized stem went into an Oxyclean bath to soak overnight. 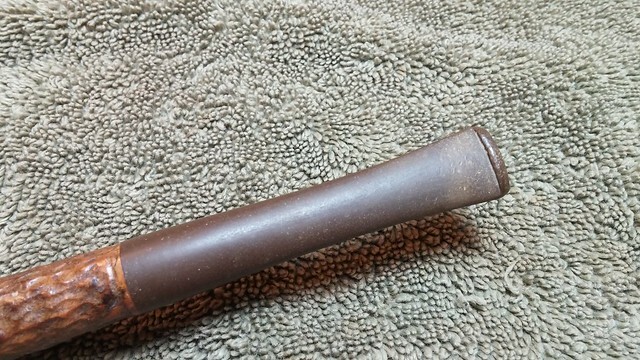 When I pulled it out the next morning, the now soft oxidation scrubbed away cleanly with 0000 steel wool and Magic Eraser. Now that the stem was clean, the single tooth dent on the bottom was clearly visible. 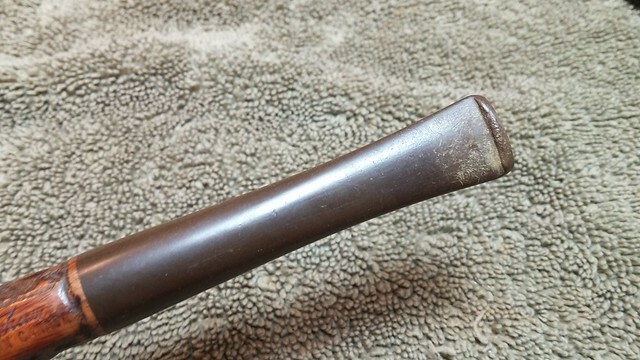 I’m glad this piper went with the Twin-Bore stem, as a regular slotted stem would likely have been bitten clean through! 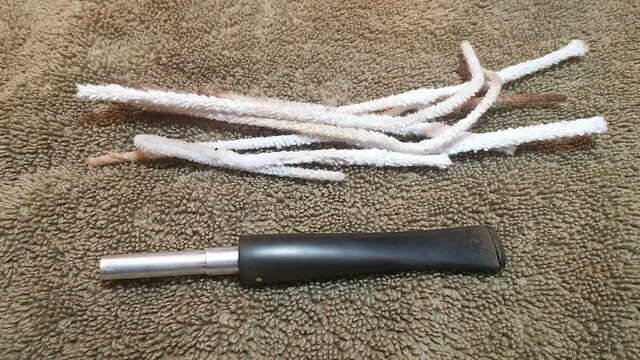 I cleaned the internals of both stem and stummel with pipe cleaners, cotton swabs and more alcohol. 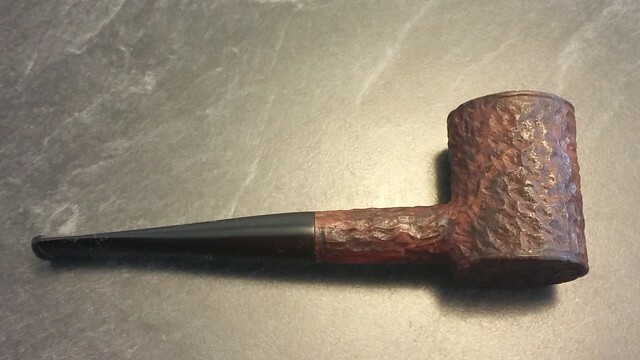 It was nice to find a clean estate pipe for once! 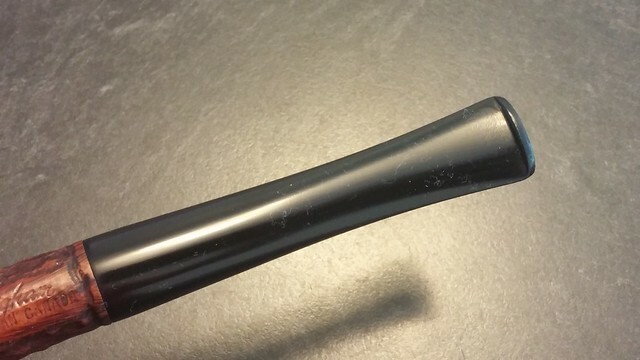 The tooth dent got a makeover with a drop-fill of CA glue mixed with activated charcoal powder. When the patch cured, I filed and sanded the fill flush with the surrounding vulcanite. I also sharpened the edges of the button while I was at it. These pics show the Before and After; I have yet to do the final micromesh stem polishing. 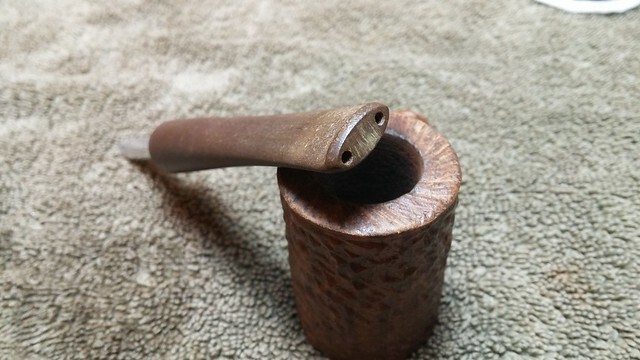 With the stem sorted out, I turned to the stummel for a refresh of the briar finish. 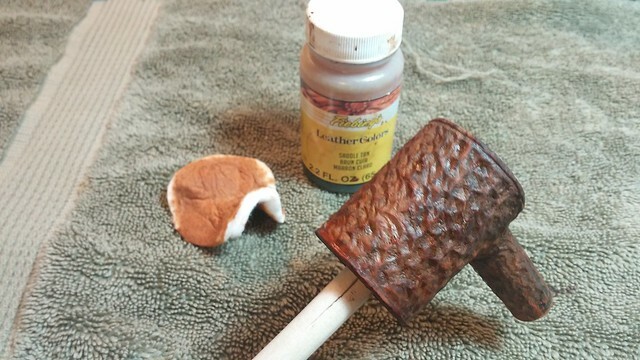 There wasn’t much left of the original stain, so I hit the briar with two coats of Fiebing’s Leather Dye starting with a coat of Saddle Tan and then a coat of Black. 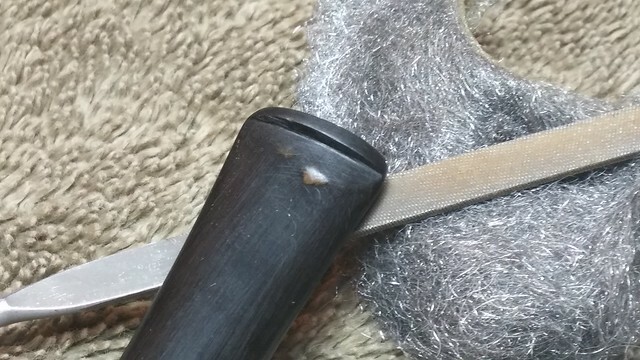 When the Black was dry, I rubbed the stummel gently with damp 0000 steel wool to remove the black from the high points of the rusticated finish. The resulting multi-toned finish gives the stummel more depth and interest than a flat coat of one colour. 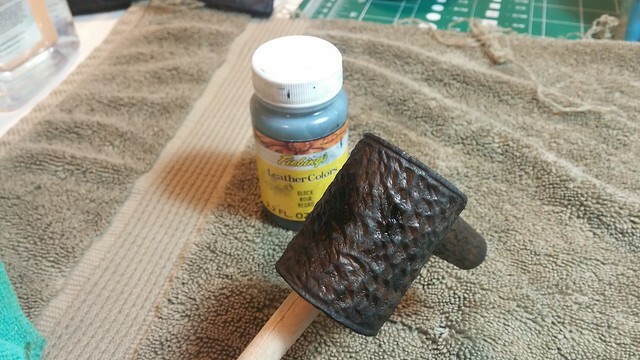 A light coat of mineral oil refreshed the briar and added even more depth to the finish. Then it was on to the buffer for final polishing and waxing. 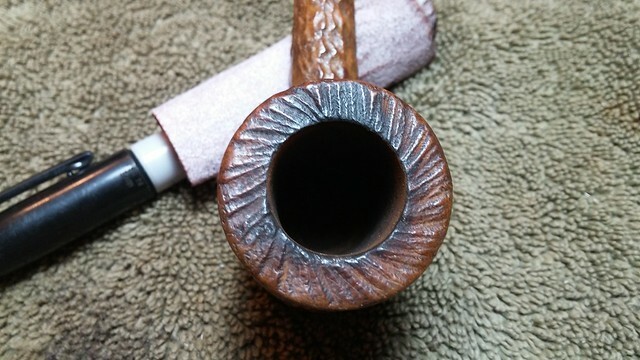 White Diamond compound on the wheel pulled a bit more black dye off the briar and removed the last of the sanding marks on the stem. 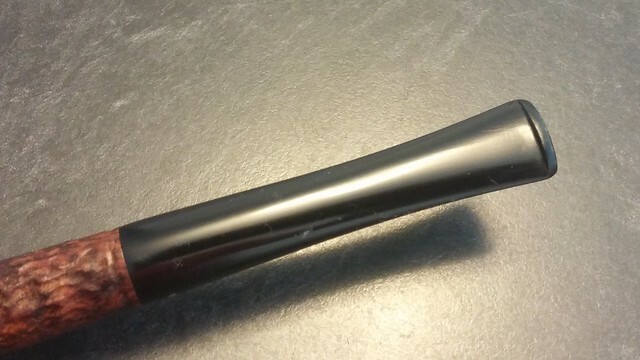 Several coats of Carnauba wax added some protection for the new finish and gave the stem a mirror shine. 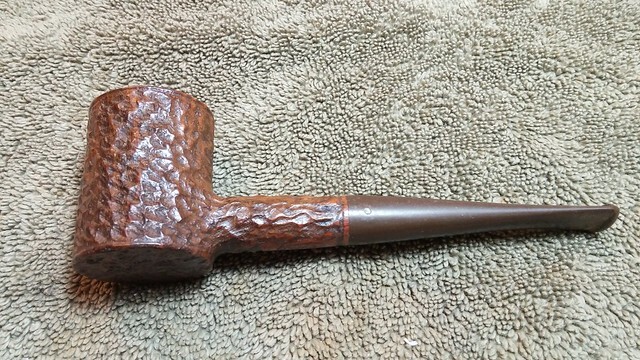 I’m looking forward to packing an inaugural bowl into this vintage Brigham Poker. 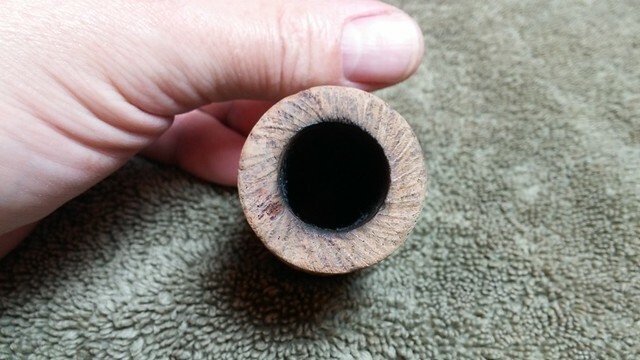 With its larger (0.75” x 1.5”) chamber, this pipe may just be the Flake pipe I’ve been looking for to flesh out my regular rotation of briars. 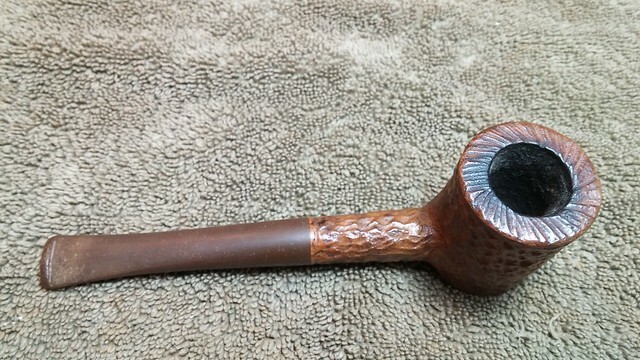 Thanks for joining me for another pipe refurbishment. 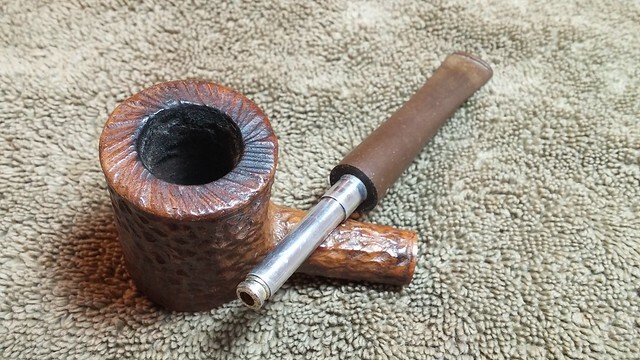 This Poker, with its uncommon size stamp and Twin-Bore stem, was a fun one for me to work on. 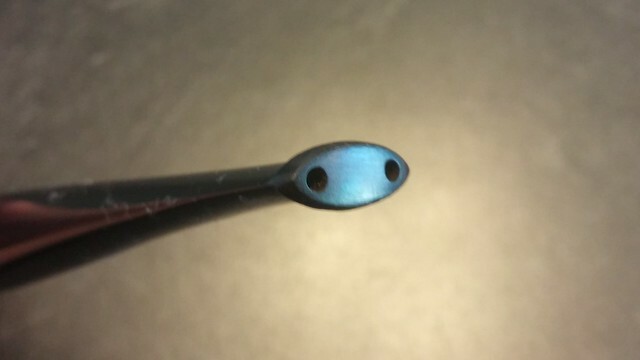 This is the first twin bore stem I have seen on a Brigham. Thanks Charles for posting it. Nice work as usual. Your timing couldn’t be better – I just acquired a small handful of Brigham’s from an estate. It will be my first exposure to them. This poker looks lovely! Thanks Jill! Have fun cleaning up your finds! I’d live to see pics when you’re done. Charles I always learn something new when I read your blogs. You’ll see what I took from this one in my own next blog. Thanks, as always, for sharing! As you know I am a big poker shape fan and that’s one sweet poker! 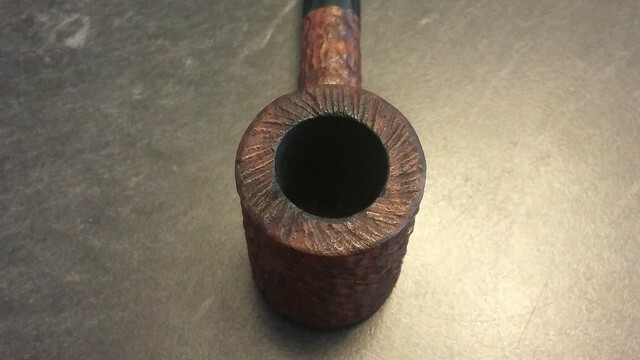 I really like the rustication on the rim. First twin bore poker i have ever seen as well. Cool find and nice work refurbing it.